One of the best ways to experience the panoramic views that Darjeeling is so famous for, is by taking a ride on the ropeway. It's also called the Rangeet Valley Passenger Cable Car because of the spectacular view of the valley around the river Little Rangeet. You will need to board the cable car from Singamari which is 3kms (i.e. 1.8 miles) away from Darjeeling Chowk Bazaar. As you ride the cable car, in about 45 minutes you will travel from an altitude of about 7,000 ft. (or 2134m) down to 800 ft. (or 244m) where the last station Singla Bazar is located. However presently the ride has been shortened to a station called Tukvar from where the Gondolas return. Darjeeling ropeway started in 1968 and is the first cable car system in India. 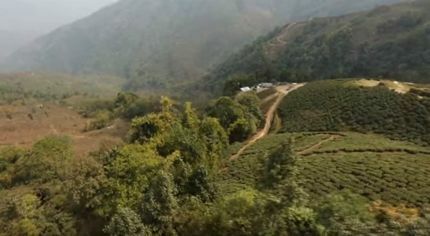 It was initially set up to cater to the tea gardens at the valleys below which did not otherwise have an easy access. Starting with just one cable car or a gondola, it was upgraded to accommodate 16 cable cars each having a capacity of six persons. So what can you experience while riding Darjeeling Ropeway? There are several stops or cable car stations in the original route between Singamari and Singla Bazar which is 8kms (i.e. about 5 miles) away located at the bank of Ramman river. Earlier the cable car stopped at Tukvar Village (which is well known for its vast stretch of tea estate that started in 1856), followed by another village called Burnesbeg, and then the Singla Tea Estate which is owned by the Jayshree Tea Company. From the cable car you can get breathtaking view of the valley below, see the spread of lush green tea gardens on the hill slopes, flowing rivers, forests, waterfalls and to top it all the magnificent view of the Eastern Himalayan range including the snow capped peaks of the Kanchenjunga. Where else can you get such a bounty of the nature all in one place? You can actually see two flowing streams down below. One is the river Ramman and the other is the Little Rangeet. They both meet with the Great Rangeet river which originates from a glacier of mount Kabru. The Rangeet valley is full of flowers and butterflies and is located in the Bijanbari area. The Little Rangeet river is well known for its many fresh water fishes. The entire Singla has a forest area of over 1,500 acres. So what are the attractions and what can you do at the lower stations? Plenty! Since there is no set time limit on the ropeway, you can take break journeys, hop on and off the cable cars without having to bother about coming back to Darjeeling at a fixed time. Of course you will need to return before the ropeway operation closes for the day. Visit the Tea Estates, take a guided round through a tea factory and see how is tea processed after being plucked from the gardens. Take a light trek through the beautiful green tea gardens that have well laden paths, see the local women plucking teas and enjoy the views. It's always a special experience. Take snacks and other refreshments at the kiosk counters of the stations. Or just sit down and relax at the sit out, enjoy the nature and the ambience. Darjeeling Ropeway started in 1968 and went through major upgrades in 1988. It is a joint venture between the West Bengal Forest Development Corporation Limited (WBFDCL) and a private company called Conveyor and Ropeway Service Private Limited (CRSPL). Over the years it has become one of the key tourist attractions in Darjeeling. However since the day an unfortunate accident took place on October 19, 2003, the ropeway had remained closed for a long time. 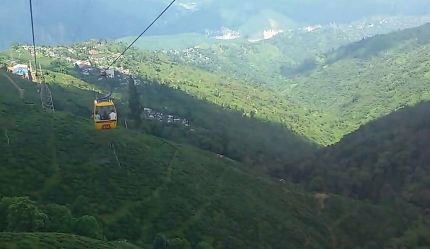 Three cable cars slipped out of the track from Darjeeling Singamari station and crushed into the tea gardens some 100 feet below causing death to four passengers and injuries to several others. Several years later and after the second inspection by the Public Works Department, clearance was finally given to reopen the ropeway by end of 2011 or early 2012. In September 2011 when I personally went to take a look, the steep staircase leading to the cable car station seemed virtually inaccessible due to lack of maintenance. I found it hard to believe that it could reopen soon. But it did! Darjeeling Ropeway had re-opened in February 2012 after more than 8 years. From Lebong Cart Road at Singamari, there is a signage and a narrow concrete stairway leads to an upper level where the ticket counter is located. During tourist seasons there is usually a long queue up there and the average wait time could be easily 45 minutes to 1 hour. The ropeway (cable car) presently goes up to Tukvar and returns to Singamari base station at Darjeeling. There are 12 gondolas in operation each having a capacity of up to 6 persons. From an altitude of about 7,000ft you will go downhill to about 6,000ft at Tukvar. If you want a full gondola to yourself, then you need to buy six tickets. You can get off at Tukvar... there is a small sit-out once you get off the Gondola. You can sit there and enjoy the views of the valley and lush tea gardens around, or take a walk through the Tukvar tea gardens. Note that on your return, you will again have to queue up to board the cable car. If you want to avoid this wait on return, don't get off at the destination and get back on the same gondola. There is also a small eatery next to the cable car station at Tukvar... an open air restaurant on the roof of a building where you can get some refreshments. They also sell packaged tea which you should avoid. But you can have a cup of hot tea and enjoy the views. At Tukvar, there is a toilet but not well maintained. Having spent some time at Tukvar, board a gondola to return. The total round trip is about 5kms (i.e. 2.5kms each way). The cable car moves quite slow and takes about 15 minutes each... add to that the time you spend at the destination. If you decide not to get off at Tukvar, it will take total of about 40 minutes for the round trip. For best views, try to take a seat facing downhill. Some Gondolas are new while others are old ones with glasses full of marks and not suitable for taking good pictures. Also ventilation window remains mostly open, so carry some warm clothes to avoid the chill. 10am to 4pm during off season (winter and monsoon) and 10am to 2pm during high season (summer and autumn). Why shorter hours during peak season? Because once you buy the tickets, you will find yourself behind sea of people waiting for their turn. The average wait time can be anywhere between 1 hour to 90 minutes. Therefore they close the ticket counter early during high season to clear off the long queues. So try to go early in order to avoid long queues. Note that on 19th of every month, the Ropeway remains closed for maintenance operation. Update April 2018: Effective April 1, 2018 the ropeway operation in Darjeeling has been suspended for indefinite period because the 2-year old lease agreement between the company running it (Conveyor and Ropeway Services Private Limited) and West Bengal Forest Development Corporation has expired on March 31, 2018. So we need to wait until the new tendering process is completed and the lease agreement is renewed. It can take a while. Update January 2019: Darjeeling Ropeway operation has finally resumed effective 6th January 2019 after remaining closed for over 9 months. Rs. 200/- per person (for 5kms round trip). Child (3-8 years) is Rs. 100/-. Darjeeling Ropeway or cable car station is located at Singamari which is 3km (1.8 miles) away from the Chowk Bazaar (the main market center of Darjeeling at the lower level). You will get cabs or shared jeeps from Chowk Bazaar that takes about 15 minutes to reach unless there is a traffic jam in the market area which is often the case. Get down at North Point on Lebong Cart Road which is quite close to the St. Joseph's college. Across the road you will find a narrow and steep stairway that leads to the Singamari cable car station located at a higher level. You can see the station at a higher level from the road and the cable cars passing over your head down to the valley below. Check out North Darjeeling Map to see the location of the ropeway station. Hi Raj, Is the rope-way closed now? I can see last update was on April 2018 that rope-way will be closed indefinitely. It is still closed. There is no news when it may re-open. After 7 months of closure following the agitation in hills for a separate state, Darjeeling Ropeway has finally resumed its operation in January 2018. Although peace was restored in the hills in September 2017 itself, the ropeway could not operate because they could not renew the annual NOC (i.e. No Objection Certificate). That being done, the operation has now resumed. However the ticket cost has been increased from Rs. 175/- to Rs. 200. The ropeway service is operated by the company Conveyor and Ropeway Service Private Limited (CRSPL). Hi Raj, I am planning my visit to Sikkim and Darjeeling tour starting from New Jalpaiguri in the last week of Mar'18. Will Darjeeling ropeway be crowded during this time? What will be the average wait time? And should all of us including old and young stand in queue to board or we can wait for our turn. Regards. March is relatively free of tourists, the high season really starts from April. But there can be tourists, so expect some wait time although not much (may be 15 minutes or so). All need not board the gondola together. Your group can be in different gondolas. Dear Mr Raj, Kindly suggest whether Tukvar rope way is operational now as heard in past that it had some issues on renewal of NOC. We are traveling between 20-22 MAR....kindly confirm. Thanks and warm regards. Sir, we are going to visit Darjeeling during November this year i.e 2016. What I want to know is that whether we will be able to enjoy the rope-way ride as I have heard that it is presently not operating. Regards. P.S: You have done an excellent work on your website and the information are very useful. I've planned our vacation according to your information. The ropeway operation is suspended now. Nothing can be said until the company responsible renews the NOC and takes care of the sagging of the cable between poles. Sir, I want to know about online advance booking system for CABLE CAR in Darjeeling. Please help me. You can't avoid the queue. There is no online booking system of Darjeeling cable car. Dear Raj, Such a nice and informative web site developed by you. I would like to update that ropeway is now closed after earthquake. I had been to this place on 4 May 2015 and it was closed. Currently the ropeway is operating between Singamari (the starting point) to the next station Tukvar. It takes about 15 minutes one way. It's not going all the way down to Singla Bazaar.